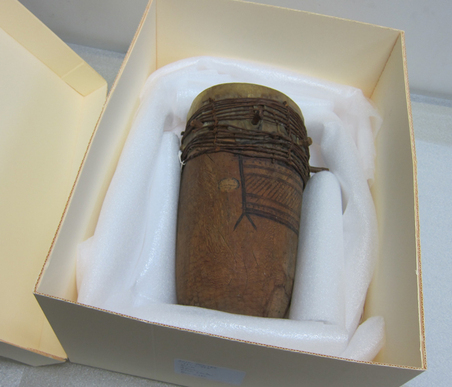 In 2003, The African American Museum in Philadelphia acquired a gift of over 400 African artifacts from the Philadelphia Civic Center Museum (formerly known as the Philadelphia Commercial Museum). This acquisition more than doubled the number of African artifacts in AAMP’s Collection. The majority of the objects had been exhibited in the Paris International Exposition of 1900 and the French Colonial Exposition of 1889, including weapons, tools, ceremonial objects, textiles, household goods and musical instruments from Western Africa—particularly Liberia, Senegal and Guinea. Many of the West African objects AAMP acquired are wood-carved, including bowls; musical instruments, tools, and stools. In addition to the artifacts from West Africa, the collection contains a small selection from Tunisia, including jewelry, leather footwear, harnesses, cushions, and trays. The North African objects of the Civic Center Museum were acquired chiefly from the Berlin and Vienna Ethnological Museums in the 19th century. 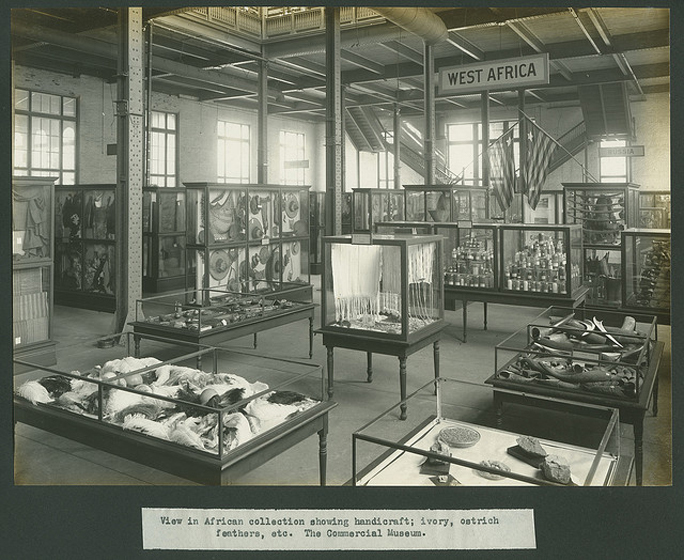 Philadelphia Commercial Museum: view in African collection showing handicraft; ivory, ostrich feathers, etc. [caption taken from label with photograph]; from a photo scrapbook of the Philadelphia Commercial Museum, taken circa 1910. The Philadelphia Commercial Museum opened in 1897 at 34th and Spruce Streets, and was the first institution in the United States to actively promote America's businesses and industries in foreign markets, and especially in the emerging markets of Africa, Asia and Central America. The idea for the Commercial Museum came from University of Pennsylvania botany professor Dr. William Wilson, who was inspired by his visit to the Chicago World’s Fair in 1893. Wilson purchased much of the objects in order to fashion a permanent world’s fair exposition in Philadelphia. Soon the Commercial Museum became the unofficial repository for artifacts from world’s fairs and by the early twentieth century was among the biggest museum of any kind in the nation and became a destination not just for businesses, but for school groups, locals and tourists as well. There was an attempt in the 1950’s to revitalize the museum and its surrounding area with a new public space dubbed the Civic Center, incorporating Convention Hall and the museum and renaming it the Philadelphia Civic Center Museum. The Philadelphia Civic Center Museum closed in 1991. The Civic Center’s hundreds of fascinating collections were distributed to museums in the region, including the Philadelphia Museum of Art, The University Museum and the African American Museum in Philadelphia. The preservation, cataloguing and re-housing of the Jack T. Franklin Collection and the Civic Center Museum Collection was made possible with funding from “Save America’s Treasures”, administered by the National Park Service in partnership with the President’s Committee on the Arts and Humanities, the National Endowment for the Humanities, the National Endowment for the Arts and the Institute of Museum and Library Services. To view the Jack T. Franklin and Civic Center Museum Collections, please scroll down to the link for AAMP’s Collections (highlighted in red) and enter the keyword(s) “Franklin” or “Civic Center”. Requests for reproduction of the objects or images from the African American Museum in Philadelphia’s Collection must be made in writing. If the request is accepted, a contract will be sent to the requestor stating the terms of usage and any associated fees. Permission to publish or quote from unpublished manuscripts or from published items under copyright, must first be obtained from the copyright holder. It is the researcher's responsibility to secure that permission. In many instances, contact information can be provided for copyright holders or donors. Additionally, permission to quote from manuscripts must be obtained. Requests should be sent to Collections@aampmuseum.org or The African American Museum in Philadelphia, Collections Department, 701 Arch St., Philadelphia, PA 19106.